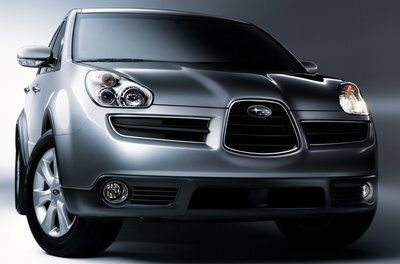 The B9 Tribeca is Subaru's flagship vehicle. Deemed a crossover, it is longer, wider, and taller than the Outback, upon which it is loosely based. With 3 rows of seating, it can seat up to 7 passengers. Power is provided by a 250hp 3.0L 6-cylinder boxer engine. A 5-speed automatic is the only offered transmsission. All-wheel-drive is standard as is stability control. The prominent grille is intended to evoke Subaru's heritage as an aircraft manufacturer. The interior echoes the same theme with a large flowing dash and center console "cockpit" design. The B9 Tribeca is built in Lafayette, Indiana. For 2007, the Tribeca receives a minor update to the front grille. An optional special edition package adds chrome mesh treatment to the front end.